We took a road trip to secure some delicious fruits from our dear friends & fellow family farmers over at High Hill Orchard this week. They had quite the blackberry crop this year so we braved the rain yesterday and picked lots of blackberries for you. We also snagged some still firm and highly coveted early peaches (they are really known for their peaches!). Did you know the winter frosts are to blame for midwest fruit crop losses this year? Here on the farm we work for, Tanglefoot Ranch, there is a peach orchard but the majority of the peach buds on the trees froze after beginning their growth and as a result their will be little to no peaches. High Hill Orchard also had frost loss in their orchard so the few peaches that we will have for you are some of the few local peaches you’ll come across this year. Also, we identified one of our mystery winter squash! 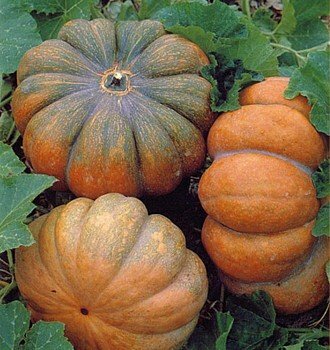 It is a Fairytale Pumpkin, these are super amazing for a number of reasons. For starters, they look like the pumpkin carriage in the movie Cinderella, hence the name. They are even better for pumpkin pie making than the traditional pie pumpkin and they are much larger. Bigger means more pie right?! Our #1 reason for loving these is because they are great keepers! The massive one we grew last year (it’s like 50lbs!) is still good in our basement. It is almost a year old. Will you eat your blackberries raw or preserve them? If you want to preserve them you can flash freeze them to use in oatmeal, smoothies or whatever OR can them. I’m personally canning some tomorrow after finding this mouthwatering maple, brown sugar, bourbon blackberries recipe. We really don’t need more jam canned (especially since we don’t eat much bread) but I can’t resist trying out the new recipe. Consider using your peppers to stuff this week. We just made sausage stuffed Itilian sweet peppers loosely following this recipe and even our picky kids scarfed them down! It’s a must try. We are still experimenting with goats milk soap recipes right now. The pumpkin spice fragranced soap we had is nearly sold out and my girls and me have been making new soap batches like crazy. You can click here to see and even order soaps.